For The Love of Green Tea, Garrett Popcorn Takes on Matcha Flavor! Garrett Popcorn originates from Chicago, USA, but that doesn’t mean they only have classic American flavors. 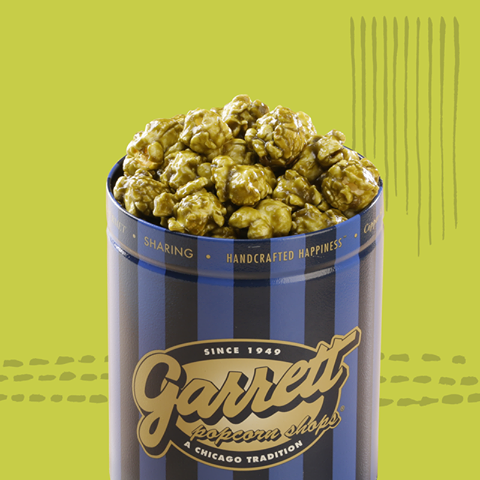 Garrett fans will be thrilled to know that the gourmet popcorn is taking on an Asian flavor in their New Limited Recipe – Matcha CaramelCrisp. Available at all shops from 16 March to 10 April, 2016, Matcha CaramelCrisp is set to tempt popcorn fans with a luscious matcha note. Matcha, or green tea powder, is rich with antioxidants. Matcha can also boosts metabolism and calms the mind, relaxes the body and enhances one’s mood. Quality has always been Garrett’s top priority. Using the finest quality of ingredients without preservatives, Garrett continues its legacy through its new flavor. Using harada matcha sourced from one of the finest tea growing areas in Japan – Shizuoko prefecture, Garrett takes pride in developing the new Matcha CaramelCrisp with the goal of having a strong matcha flavor without compromising on the signature flavor of CaramelCrisp. So ‘Aki Matcha’ green tea powder is chosen to be the best match for the luscious CaramelCrisp. Garrett Popcorn has always been my little secret addiction. Juggling a family, full-time work and blogging is not impossible but can be quite a feat. So, to treat myself and my family every now and then, I enjoy indulging in the premium popcorn handmade daily in copper kettles. The three of us have our very own favorite Garrett Popcorn flavor but we are always game to try new ones. It’s always a good time when it comes to savoring Garrett! We have taken Garrett Popcorn on our road trips, as gifts for family and friends, to parties and potlucks and more. It has always been a crowd pleaser. My family and I enjoy Garrett Popcorn in the comfort of our home, sometimes as snack, sometimes as dessert. We will definitely have a tin of Garrett Popcorn by our side for movie nights. We also have game nights with our little one and there’s no better time to enjoy some treat of Garrett Matcha CaramelCrisp during this time. A game of Domino Tornado certainly works up one’s appetite for the crunchy balls of delectable sweet popcorn. Though I was a bit hesitant that my little one would not like matcha flavor, all is put to an ease when he took a few and continue to pop them in his mouth happily. The new Matcha CaramelCrisp is wonderfully aromatic with an intense and lush green tea aroma. The matcha flavor really stands up to the caramelized note of the CaramelCrisp. I can taste a delicious bold matcha note and also a deep richness from the caramel on the popcorn. The very distinctive bittersweet matcha taste also heightens and balances up the richness of the signature CaramelCrisp very well, so much so, the Matcha CaramelCrisp is less sweet but more moreish in flavor. It’s a great flavor that many should try. Uniquely intense with matcha, there really is no others like this in the market. There is a certain freshness and familiar sensation when enjoying the Matcha CaramelCrisp, possibly also due to the fact that I enjoy matcha a lot. Surprisingly, my little one was enjoying his usual favorite beverage of soy bean milk that evening when we had our first taste of Matcha CaramelCrisp and we found that this flavor really matches so well with the soy bean milk. The creamy and milky nutty soy note seemed to match really well with the intense and bittersweet crunchy popcorn. I think another great pairing of beverage would be milk too since matcha and milk has always been a great match. Since Matcha CaramelCrisp is only available for a limited time, one should definitely head on over to the many Garrett Popcorn Shops to try this new flavor. Garrett Popcorn only makes limited batches of Matcha CaramelCrisp each day due to freshness and quality control. So make sure you don’t miss the new flavor of Matcha CaramelCrisp this month before its finishes! To keep updated with Garrett Popcorn’s promotions and new flavor, LIKE Malaysia’s “Kedai Garrett Popcorn” Facebook to follow them so you don’t miss out on any new treats of Garrett! To locate a Garrett Popcorn store, visit the store locator here.